It’s the ultimate dream, travel the world to experience all the major sights and hidden delights tourists don’t get to see. Even better, the icing on the cake would be to earn an income from your travels. The question everyone asks is whether this really is possible. The answer is yes – with a travel blog. In its most basic form, travel blogging consists of traveling to different places, writing about your experiences and publishing them onto an online blog. If you have enough money saved to live on, you could use your travel blog to share your journey without worrying about readership or making money. However, most travel bloggers monetize their blogs with the aim of either funding their travels or earning a professional income. With that view in mind, let’s look at how to start a travel blog. Many new travel blogs will cease to exist early on, so if you want to be published for many years to come and make a decent income from your travels, you need to put some thought into your blog. Just because you build it does not mean that your audience will come. Instead, you need to work hard at creating a platform people want to visit time and again. Although it may be tempting to head off on a plane and write your blog when you have a spare moment, doing this is unlikely to make you money. Treat it like a business and decide how much you want to earn in advance. When you love something, it is easy to fall into the trap of just doing it because it's your passion. Unfortunately, that sentiment won’t earn you money, so you have to decide in advance you are going to be paid for your work. This attitude will help you view your blog as a business, rather than a hobby. As part of your business plan, you need to decide in advance how you are going to run your blog. Know where you want to travel, how you are going to get there, where you are going to stay, etc. Devise a content calendar outlining the content you will be publishing each month, and decide the methods you will use to monetize each post accordingly. In real life, it is likely your plan will change and fluctuate, but having a guide provides you with focus. Before you can earn any money from your blog, you need an audience. There are many methods to build readerships, from paid advertising to organic searches. Make sure you always have several methods in place at any one time to maintain consistency. You need to write with your readers in mind. Do your research and find out what questions your potential traffic wants answered, and then address those queries. If you base your blog around solving your audiences' problems, they will return again and again. There are many travel bloggers, so to stand out from the crowd you need to be original. Use a different approach, or find an exclusive niche within travel blogging. Create a unique selling point that no one else has. Discover a niche that works for you and your audience and give it your own voice. If you try and copy someone else, your authenticity will suffer. You can always be better, so commit to learning all you can. Whether you improve your writing skills, your search engine optimization techniques, or your knowledge of traveling, always look to learn all you can. In the early days when your budget may be tight, you may not be able to invest in hiring professional designers or other help, so initially invest as much time as you possibly can. When you have more money, invest some of it back into your website to ensure it is as professional as possible. While you are traveling, make it a habit to record everything as you never know when it may come in handy. Take photos of everything, record where and when you visit different places, jot down your emotions and details about the people you meet. All these notes will help when your creative juices need a push to put words on the page. Your blog needs time to build. Your audience will need to get to know you before they trust you, so be consistent and persistent with your entries. Write as much as you can, particularly in the early days. A travel blog is as much a job as it is a way of life. You must love your job. If you don’t, you may need to question if you are in the right industry. How much do travel bloggers earn? When embarking on a new career, it’s normal to want to know how much you can earn. However, with any freelance role, how much you earn is dependent on the amount of work you put in. As a rough guide, an established travel blog can expect to make $3,000-5,000 a month, although some make much more. At 7:00am today, we climbed straight to the top of the Huayna Picchu mountain where we took a seat on a rock and hoped for the thick clouds to part. And eventually, part they did! What a day. The Macchu Picchu experience was 100 times more impressive than I envisioned! Derek has been traveling since 1999, but originally he funded his travels by odd-jobbing while on the road. However, this all changed in 2008 when he published an eBook about his journeys, which earned him enough to carry on traveling without working on the road. This led to the Wandering Earl blog launching in 2009, with the readers of his book becoming his first followers. The blog grew, and by 2011 he was earning $2, 500 a month from his book sales and affiliate marketing. His earnings are now reported to be $12,000 a month. While in Medellin, I visited La Comuna 13. This district covers 22 neighborhoods and was once one of the most violent in the city. If you didn't live in that neighborhood, you couldn't enter. Steep and limited roads and few walkways up the hill left the community isolated and impenetrable. However, in 2011, escalators (donated by Japan) were installed in the neighboorhood to make it easier for residents to get into the city. Soon, street art was popping up the sides of buildings near the elevators and tourists started coming to look at the art. Businesses flourished selling art, coffee, and food to the tour groups that come here each day (and in high season, there are A LOT of tourists). Now, even some locals come here. The art and escalators have opened up this area. Crime is still a problem in deeper parts of the neighborhood and you can't venture here at night. But things are slowly changing and the art here tells the story of that transformation. Visiting tip: It's really easy to visit this area on your own. The metro goes nearby and you can take bus 225i to the escalators. It's a 5 minute ride. You miss out on the story but the tours here are like 15-20 people. I'd personally skip the big group tours. If you do take one, they are 60,000 pesos ($20). I took a tour with a friend Paula who is a guide. You could set a private tour up with her at @lasierramedellintour. She does them by request! Matt Kepnes earns a staggering $50,000+ a month from travel blogging. His blog grew from his desire to travel and make money on the way, but he started the site purely as a method of practicing his writing so he could work for Lonely Planet. But the more he developed his blog, the more he realized there was a need for budget travel advice people could dip into online. So he changed his focus, and the rest is history. Bethany has been traveling since her early 20’s. In 2014, she and her family left New Zealand and have been traveling ever since. They fund their travels and earn an income with various sources, including advertising on the website, consultancy work, web design and renting out their home. On average they earn about $5,000-10,000 a month. How do I make money as a travel blogger? Most travel bloggers make money through a variety of different income streams, rather than relying on just one method. Many travel bloggers are content to fund their lifestyle, whereas others achieve incomes that far exceed their travel costs. However, it’s worth bearing in mind that lucrative travel blogs do not happen overnight. They take a lot of time and effort to become established and develop a large following. Promote and sell products on behalf of a third party. When one of your leads clicks on your affiliate links and makes a purchase, you will get paid a commission. With no stock involved, it’s a perfect method for the travel blogger to utilize to earn money. Creating and selling your own related products can be a great money earner as all the profits go straight to you. However, making the products initially can take some time and effort. Allowing automatic ads on your website can earn some extra money each month. You could also consider charging companies to run permanent ads on your site. Established blogs often get requests from companies asking them to write sponsored posts about their products. In return, the company pays the blogger or offers products as remuneration. Speaking at conferences or at professional networking events can be quite lucrative, if you have the confidence to pursue this form of income. Top travel conferences and events you can find us speaking at include Women In Travel Summit and TBEX. Teaching others how to run a travel blog, either through mentoring, consultations, online courses or lecturing at colleges, is not only a good way to increase your income but also builds your credibility. Getting paid by other businesses to write about your experiences and travel tips can provide a good income while fitting the lifestyle of the travel blogger. Where do I find affiliate programs for my travel blog? When it comes to finding affiliate programs that fit your travel blog, you can really think out of the box. Let’s say you are writing a blog about what insurance you should have as a travel blogger. You could discuss travel insurance and point to affiliate programs that match. 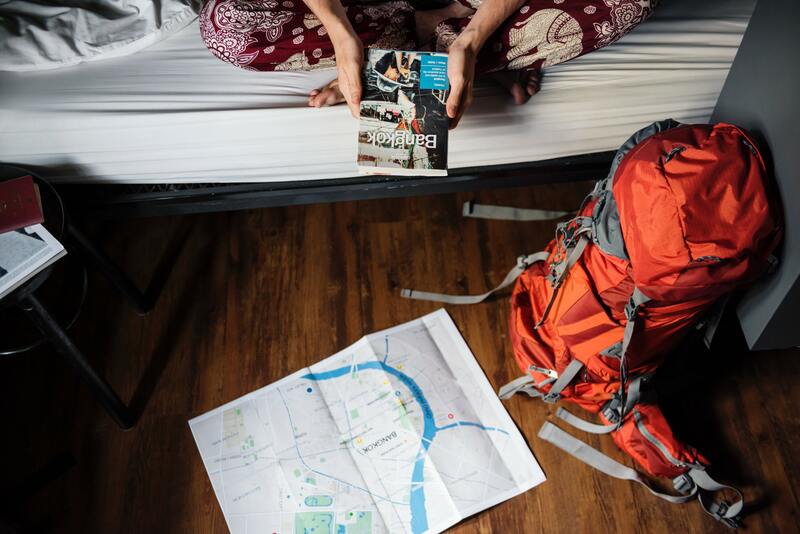 Or perhaps you want to talk about how to find affordable accommodation while on the road. Whatever you want to write about, you can find a product or service to promote that will fit. Look to Awin’s advertiser directory for inspiration. Building a travel blog takes time and effort, but the rewards more than outweigh the hard work. For many, it is the dream job. However, to succeed you must stay focused and work at it. But most importantly, maintain the love for your job. Try to keep your knowledge fresh and this will come across in your blog. Your audience will feel your passion and buy into you. Following that, your blog will start paying dividends. If this is your dream, follow it. You’ll never look back.